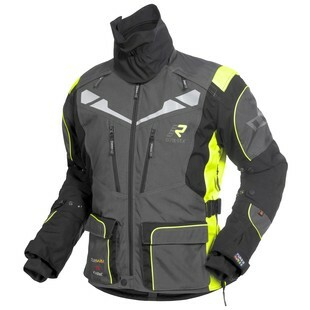 The Rukka Roughroad Jacket makes taking the rough road more enjoyable with its adjustability features, protective attributes, and small details which increase the overall comfort of the jacket. With a detachable elastic Gore-Tex collar, vents on the shoulders and sides that allow better airflow, and a detachable waterproof Gore-Tex inner liner with Outlast temperature regulation, this jacket will protect you from the elements while providing a high level of comfort. In terms of protecting you from impact, the Roughroad Jacket comes equipped with Rukka D3O Air shoulder and elbow armor, CE Level 1, and a D3O Air Allback Protector, CE level 2. If you are looking for a jacket to provide you with a high level of functionality and comfort on your next adventure, the Rukka Roughroad Jacket is a great option.